The fall semester has seen the Birnbaum Library Fishbowl put to good use as an event space. 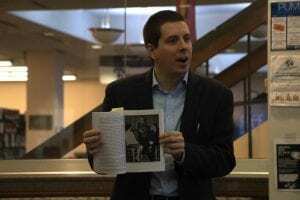 In November, Communication Studies Professor Julian Costa read from his book, David Campbell: Story of a Career, about the pioneering work of educator David Campbell. In December, the Fishbowl hosted a zine workshop and pop-up art fair organized by students and art department faculty; and most recently students affiliated with Aphros, the student-run literary magazine on the New York City campus, read selections of their writing. We look forward to more events in the spring. Prof. Julian Costa photo by Dahveed Wilkins. 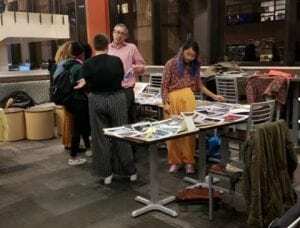 This entry was posted in Uncategorized and tagged Aphros, Birnbaum, faculty, Fishbowl, reading, Students, Zines by bplanncurley. Bookmark the permalink.